The block work got done today. As ever any job here at Rock HQ is fraught with difficulties, sometimes a simple life has its appeal but we are in the words of Shackleton "Getting there". 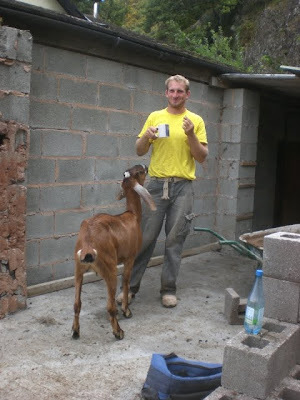 The job has got bigger though, after a chat with the Stable Sprite and our Rugby playing builder, Pritch, its been decided that the inside of the stone wall at the back has to come down and a nice new block wall will replace it. This has added at least a days hard labour for yours truly. 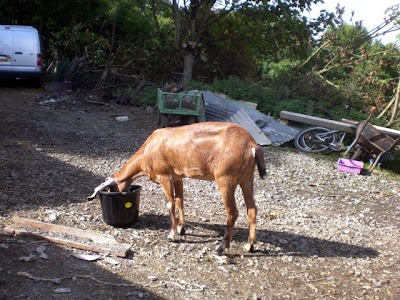 The distractions were many, goats who wanted tea and biscuits, then fell asleep in a sunbeam, head in bucket. 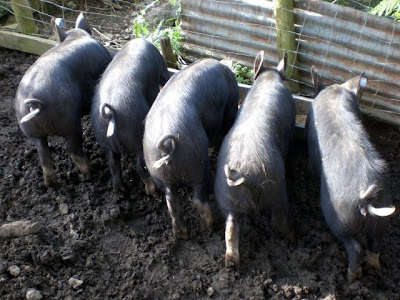 I left Pritch to it while I fed the pigs and found only four in the sty, not the expected five. 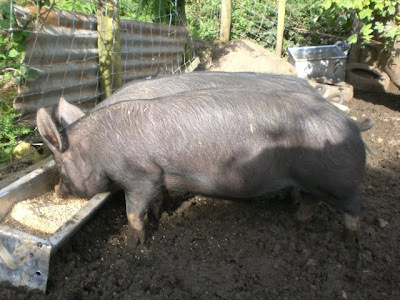 Once Bronwyn heard me calling the bushes and bracken on the common started rustling King Kong style and finally a very disgruntled pig appeared at the fence before gracefully rolling under the fence commando style to join the others at the newly excavated trough. The ubiquitous corrugated sheet was put into the breach and bolstered by two tyres filled with rocks. Its holding the pork horde back so don't knock it! Other distractions, well cheerful hikers who wanted to chat while I wanted to stop carrying 9 inch concrete blocks across the yard. Add to the mix curious chickens, mental dogs, insane bigger dogs and rampaging Ryelands, one of whom, Joan, appeared in the yard in some distress where we discovered that she had a very nasty attack of maggots which were dealt with by sharp scissors and a bucket of Jeyes fluid, its a wonder any work got done at all. In fact lots got done besides. The preparation for the tree felling entails moving the water tanks so I manfully wrestled two 250 gallon tanks from their perch and into the lane. The water collected from the stream supplies the animals and the garden, a temporary supply bypassing the tanks has been set up until the trees are cleared away, so by 2015 the tanks should be back in place. The final distraction came when I fed the pigs late afternoon. Now I had spotted a Jack Russell in the lane but thought that it belonged to a walker. As I climbed into the pig pen to do my usual Riverdance routine with the future bacon one of the pigs spoke. At least that's what I thought happened for a split second until sanity prevailed and as I hopped around the pen avoiding the slavering jaws I realised the pigs and I were not alone. "I cant see your pigs!" the voice continued. I traced the source, a new age hippy type was trying to get into the barn. Luckily my skilled knot on the baler twine was preventing a dreadful encounter between her and the hungry flesh eating porkers. This was new to the pigs so they curtailed their assault, in fact Bronwyn pushed through my legs to get a better view. "Have you got any sausages for sale?" The weird hippy type enquired as Bronwyn and I charged across the pen in a pork cavalry charge. I dismounted as gracefully as Bronwyn would allow "No!" I yelled as I climbed over to greet the stranger (and they don't come much stranger, not since the Orthodox Jews saga) "Oh its alright mate I'm vegetarian anyway"
She held out her hand to shake, I shook and looked at her other hand, the one containing the rapidly emptying can of export strength premium lager. She staggered backwards, "I just wanted to see your pigs, I love pigs, seriously I do" she steadied herself and belched. Totally taken by surprise I stood opening and closing my mouth like a stranded guppy trying to think what to say to a half cut hippy pig botherer. Reinforcements arrived in the shape of Tracey who was relieved to find I wasn't talking to the pigs and would now believe me when I told her what had slowed me down. The mad hippy rambled on about life, the universe and everything, I'm an archaeologist me, I love pigs, its not the drink talking, do you wanna make something of it or what, the Jack Russell holding her back, growling, leave it he's not worth it, until running out of lager she staggered off down the lane vowing to return one day with a metal detector because from her house she could see we lived in a Saxon field. Her Jack Russell dutifully followed looking most apologetic for its owners antics. There was a sudden squeal of delight to rival noise of the pigs, "Look what I found!" The hippy was dancing in the lane. A Viking hoarde? A Saxon Burial site? No. Even better. From inside her jacket she raised triumphantly to the sky another can of lager. More of The Stable Sprites Berkshires, spot the three week old amongst the rest! Today we left Rock HQ to attend a local show, a great opportunity to meet up with other farmers, smallholders and wannabes and compare notes. 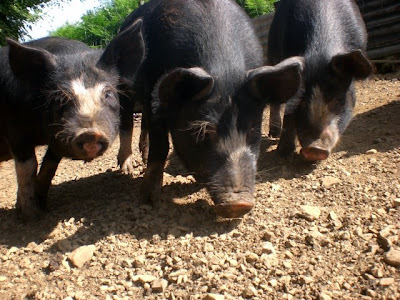 Firstly we met Champ's owners who started three years ago, same time as us, without previous experience and lucky enough to have sold a business to buy their smallholding outright. 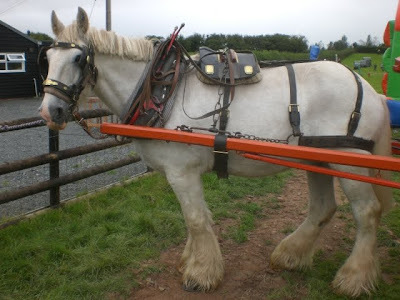 Champ here is a lovely Shire Horse who works their land in the traditional way. They also keep pigs and so we were able to discuss the rights and wrongs of modern farming and how tasty home grown bacon is. We didn't get her name but, please believe me, he was another Steve, really he was, and the guy who refurbished Champ's cart was also called Steve. 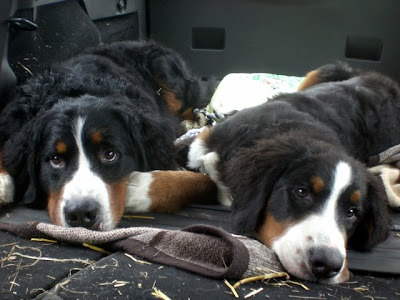 These two lovely dogs were taken straight from their farmyard and entered into the dog show. We thought it would be useful social experience, a small local show where no-one was taking it too seriously. What we discovered was that there is no such thing as a non serious dog show and some of the entrants had travelled from afar to bag rosettes and dog food samples. The first indication that its all a bit serious was as we parked alongside a couple from Birmingham who were in the process of putting up a tent to accommodate their five Cocker Spaniels, cages and mobile grooming parlour. Dotty who had never been on a lead until today, seen children or hundreds of adults before coped very well with being prodded and poked by the Judge but steadfastly refused to walk the ring. She came a very creditable fourth and got her first rosette. The Judge told me after that I had a lovely Bernese, for Gods sake get her ring trained. OK.
Next to enter the arena was Rocky, her dad and pictured above psyching himself up for the competition hes on the left). Thankfully the Judge missed him slipping his lead and running away, when Tracey finally cornered the brute and dragged him back he did his circuit of the ring and came first, then fourth in the all comers arena. So we are very happy with them both and Rocky had a reward of a bowl of ice cream. Their rosettes are proudly pinned to the Bernese tapestry in our lounge. On the way home we called in at the Stable Sprites smallholding. It looks a bit different to the last time we were there, basically he has been let loose with a small digger and cleared a vast area of trees, rocks and anything he hasn't liked the look of. The desolated site will be seeded with root crops for his pigs. Another of his sows had dropped a litter overnight. 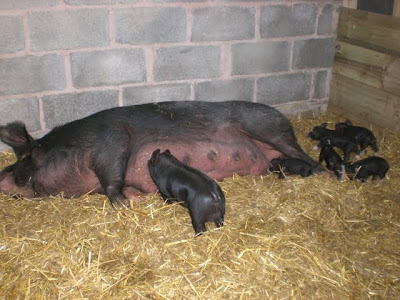 Here you can see one of the Berkshire sows having a snooze with her piglets at her tail. 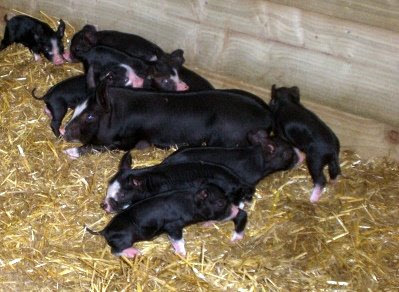 The larger piglet in one that is from the other sow and only three weeks old. They grow so fast! There I was, minding my own business waiting for my full cooked English when there were strange noises from the pantry. The cause of the disturbance was Geisha who has found the secret entrance through the black hole (the walls and roof are missing off the end) and into the pantry. She ignored all the fruit and veg and was tucking into the dog biscuits when I found her. Obviously she has forgotten that she is vegetarian. Weird creature. 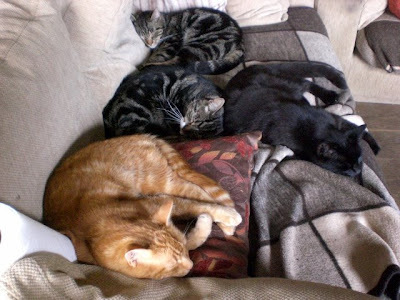 The boys have got used to the idea that Earl is back in the Rock HQ pride of moggies and they are back to doing what they do best, sleeping together for 23.5 of a day, eating rabbits .49 of a day and poohing in the pot plants .01 a day. Holiday starts today, not back at paid work 12 days. Let the good times roll! Its happened, the final breakthrough. Only four weeks ago the pigs were treated to a nice new shiny trough which attached nicely to the fence, thus allowing me to feet them without the need for body armour. 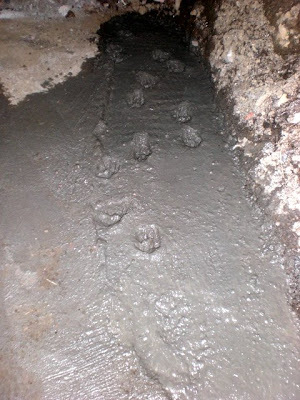 Its sudden appearance also curtailed their mining activities in and around the very ancient pig sty. Unfortunately within a week the novelty had worn off and they had moved the trough to the far end of the pig pen forcing yours truly to brave the pork onslaught twice a day to ensure the piggies got their rations. Tonight as I riverdanced across the pen my target was missing. The trough had gone. As I danced around the pigs presenting their snapping jaws with a constantly moving target I searched frantically for it. There, buried under the debris of the wall of the sty was the end of the trough. Around a ton of stone wall has given way. They have broken through and are now into the ramshackle hen house which is devoid of hens due to the fox. I dumped their food onto the floor as the squealing reached a crescendo and reached the sanctuary of the garden relatively unscathed. Next week I am on holiday. Probably rounding pigs up from the common! Some of you may be wondering how Lilly is getting on with her new owners. Well it would seem rather well, already she has been camping, enjoyed long walks and fits in with her new family extremely well. They think she is great and she just laps up the attention. 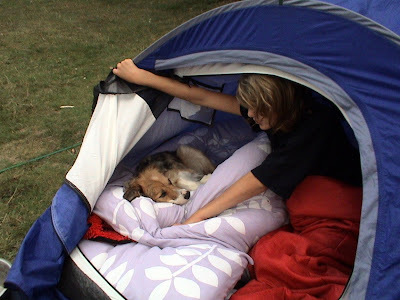 Hopefully she has stopped stinking of fox, especially if she is sharing a tent! The work on the extension continues, well the preparation phase continues. 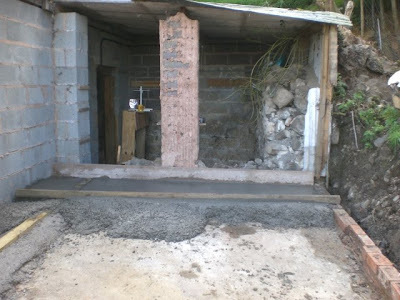 The floor is down so the next stage is to build up the block walls finally using the 199 extra concrete blocks I ordered 18 months ago when I got confused and ordered 7 square metres of blocks instead of enough to do a 7 metre wall. The wall took 51 blocks so the remaining 199 have been waiting patiently for employment. 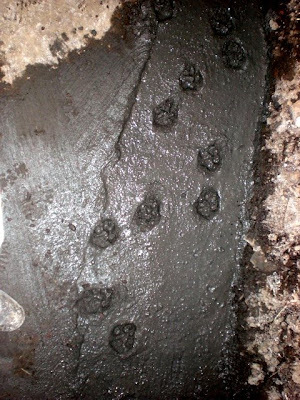 Tonight I carried 40 of them from the lane and stacked them neatly on the new concrete. The plan is to get the corners done Thursday and fill the walls in on Sunday. This is all dependant on the weather and straw bales, weather because we need a dry spell to get the block work done and straw bales because the nice man who is teaching me to lay blocks has to get all his straw in before he can spare any time to teach a novice brickie the tricks of the trade. 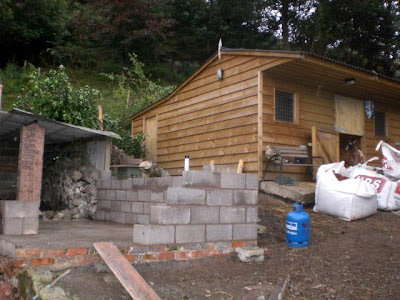 I need to know how to lay blocks properly as even when the walls are done I will still have around 120 left over which just might be enough to build a pig proof sty to replace the tin shack they have so ably destroyed. All the tricky stuff is being left to the Stable Sprite who is going to transform the rotten woodwork of Rock HQ's workshop into something longer lasting and more in keeping with the stable. To help me with the fetching and carrying of the concrete breeze blocks I had a random mix of heavy metal blaring out across the yard, loud enough to be heard in the pig pen some 100 metres away. Geisha, above, a mere 2 metres away from the speakers managed to sleep throughout the whole cacophony of distorted guitar solos as I trudged back and forth carrying blocks. She even slept as the dogs charged around sometimes barking in time with the tunes. Unbelievably the second I slid back the bolt on the tack room where her food is kept she heard that, was instantly alert, by my side and jumping in the bucket. Amidst the chaos of our evening rounds a lone cyclist appeared on the track tonight. This proved a useful distraction for the dogs whilst I made the pigs a new bed. I gave them two bales of fresh straw tonight to make up for the fact that I left a tap on at 6pm yesterday evening and remembered the fact by 10pm, in the meantime the pigs vacated their barn as 500 gallons of cold water had run into their bed. "Excuse me?" I got ready to run. "Its come off in my hand, look." He opened his dirt encrusted hand to reveal a small black object in his palm. "It's me TV knob, its bust." Thankful that the Technohermit hadn't really hurt himself I heard myself agreeing to get his TV to the shop for him. He stood for a while. "Hmmmm" I nodded still examining his knob wondering what mischief he could get into if I gave him some really strong glue. "Would you like a cup of tea Techno?" "Only if youre having one!" he shouted over his shoulder as he made his way to the front door with a remarkable turn of speed caused by the lure of the plasma screen TV. "Just a quick one like." Which lasted just as long as Emmerdale did. Uncanny really. The concrete I am happy to report survived almost unscathed, on return from the Mad Hatters T Party last night fully expecting to have to chisel a goat free from the grey slab we were happy to find only a curious cat had left the obligatory trail of prints across the fresh laid concrete. The Mad Hatters T Party was a fun evening at Tracey's Uncle and Aunts smallholding (truth be known they probably sowed some of the seeds for the idea for our venture) up in Shawbury way. They still have the ponies and donkeys Tracey used to ride as a child, no secrets given away but Charlie the donkey is now over 40 years old! (Tracey is much younger than Charlie I hasten to add!) 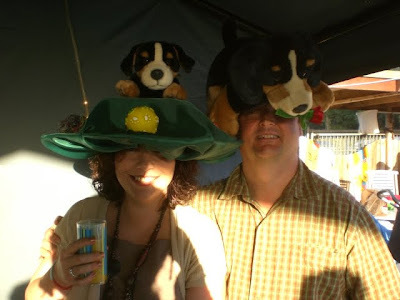 Everyone at the party sported a mad hat, ours were of Bernese Mountain Dogs, Uncle Rodney has one of those as well (spot a theme here?) and a good time was had by all at the barbq pool party. Their smallholding is somewhat flatter than ours and a bit posher having a swimming pool! If there were flat enough ground for us to have one I guarantee it would be full of ducks, fish and other livestock. 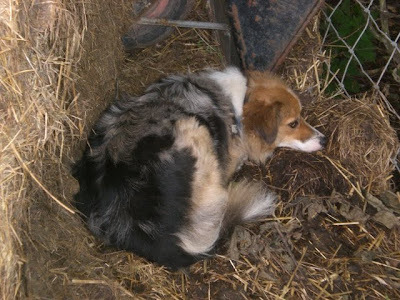 Today I drove for several hours to deliver Lilly, the Merle collie we have been fostering since March. As I set off down our lane mid morning a large fox was sat on our dirt track by the barn, obviously looking to see if I had let the poultry out. Oh for the speedy granting of our shotgun licence! Anyway Lilly, an adorable little dog has now gone to a very nice family from Dover way, we met up in a car park on the M4 where the exchange was made. 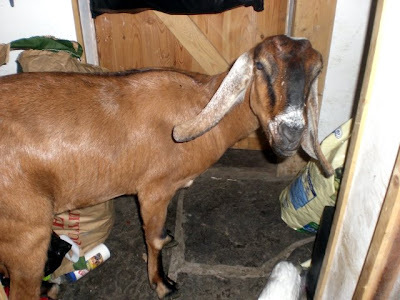 First reports are that she has settled in very well and we are very happy she has gone to such a nice family who run a smallholding. So we are back to having seven dogs. Well not quite, we have two more Berners and Zack and Holly are here on holiday so the canine quota at Rock HQ is still very high! I took the Technohermit his dinner tonight, not the usual Sunday roast as we have been pushed for time today, burgers chips and beans. He took the container with the piping hot food. I don't think he was impressed. Burger eh? Are they them round flat hard things? Well, they've been inside an animal. the sweepstake? 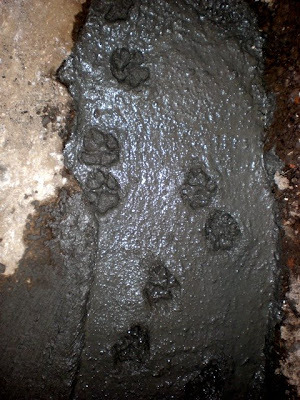 How many different animal prints will be on our concrete by the morning. 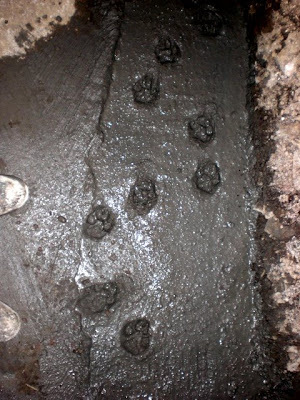 I guess five different types of claws, paws and hooves! The pigs have raised the bar, war may have to be declared. Before I describe their latest antics we had a bit of a mystery to solve when we got back today. First signs that something was not quite right was a huge pile of doings in the lane. Far too big for poultry or sheep and as there are no flying elephants here some other animal must have evacuated on the lane. 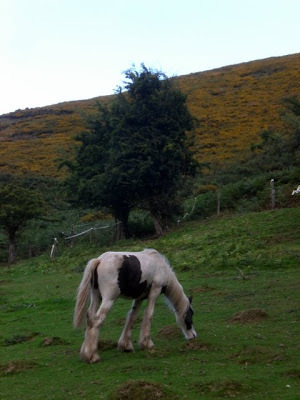 As we rounded the bend a dopey looking Gypsy Cob was stood where the car wanted to be. Not quite sure how he got there but absolutely certain he should be in the field we baled out of Fifi and grabbed him before his two brain cells knocked together and he took off over the hills. Over the last few days we have found gates open onto the hill, our sheep were literally having a field day munching the local militias grass until they were rounded up and shut the right side of the fence. There is a rumour that a local chap gets one on him from time to time and wanders round leaving all the gates open. This continues until the militia fed up with having to retrieve wandering livestock temporarily solve the matter with a few sharp words and a punch on the nose. Thinking Apollo may have been one of his latest run free projects we pondered on what had happened. A quick recce of the perimeter suggested a different story. Apollo is a horse who is fixated with his backside, so much so he spends hours, literally hours scratching his bottom on anything he deems suitable. Today he was stood on a steep section of Willow Rise scratching himself on a rotten post which snapped causing that section of fence to suddenly disappear from behind him. 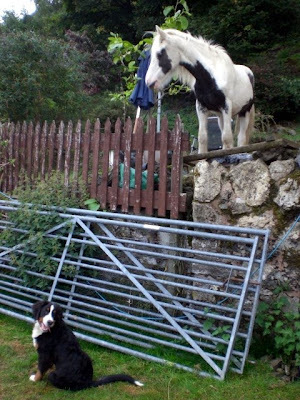 He then did an equine backwards roll through the sudden gap and when he recovered from the surprise found himself the wrong side of the fence. Not one to waste an opportunity he spent the next few hours stuffing himself until we came home. The trough was placed against the fence next to the garden so I could feed them without actually risking mortal injury by getting in the pen. The pigs, obviously missing the sport of making me jump like a demented bunny have moved the trough to the far end of the pig pen thus forcing me to enter their domain to do battle. 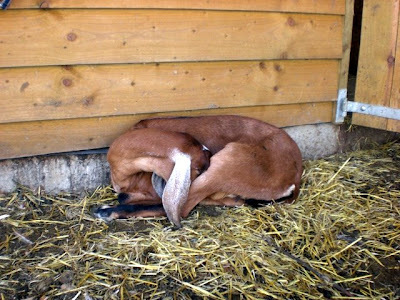 Their latest tactic is to lie quietly in the shadow of the barn and to rush en masse when I get halfway across the pen. A race then ensues as we all rush to the trough. I win if I deposit the feed in the trough before the pork swarm can create fresh wounds on their irate owners legs. We are under siege from foxes. Poultry that survive being sat on by goats run the gauntlet of predation by the fox. To combat this menace we have tried various methods, none successful. There is a story that goes around that the increasingly desperate poultry owner finally succumbs to, that of, its a known fact, Guinea Fowl are good guard birds against foxes. They are so vigilant they keep watch while the other birds do the important things like sunbathing, first sign of the fox they scream, form a circle and run back to the hen house, thus saving the hens. I have always dismissed this as nonsense, as equal a nonsense as buy a Llama, they keep foxes away in South America, they can do the same here. Yeah right. However, losing 80 odd birds in 12 months and several potent ail Christmas dinners does funny things to you. So when Steve (yes another one) offered to give us two Guinea Fowl I was nearly convinced. As they were free I was persuaded to take them. Phone in two weeks and they will be ready. You said phone up remember? Erm..... Theres a bit of a problem. Yes. The fox got them all. 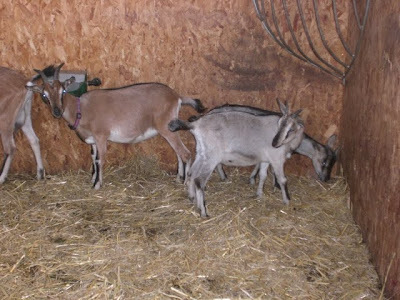 These are the Old English Goats settling down for the night. I haven't been able to photograph it yet but they pile up in this corner, with the chickens and turkey chicks on top of them. They look quite comical. Until this morning when the pile unpiled itself to get to breakfast and one of the turkey chicks continued to snooze. Permanently. Squashed flat under a pile of goat flesh. Two down one to go! Otherwise its been a productive evening at Rock HQ. Lilly is ignoring the advice from the vet and leaping around. The Technohermit shared his strawberries with me. 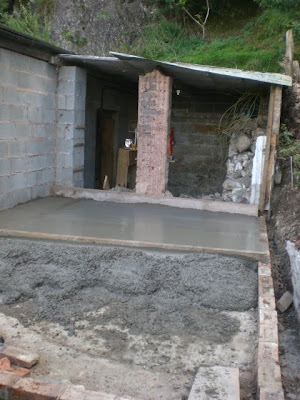 The pigs chose to behave rather than try to take chunks out of me and we are one step closer to getting the new build done as the bricks are down ready to be filled in with concrete to make the new floor. has been across my concrete! 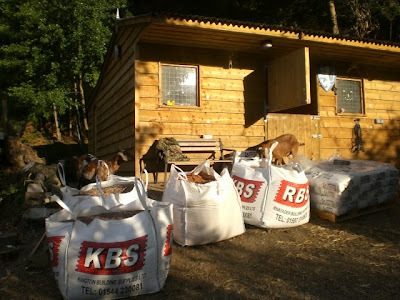 While we were out today the nice builders merchants delivered five tons of gravel and cement powder which will become the floor of the new extension to Rock HQ. Maggie and Geisha were inspecting the sacks just on the off chance that some food had been placed inside instead of aggregates. 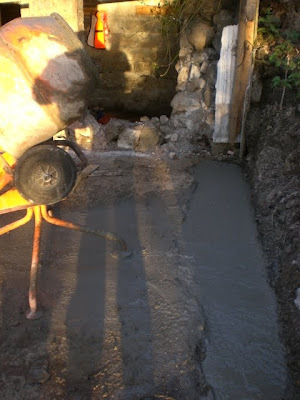 Never having mixed concrete or been shown the arcane power of the mixer it was an interesting evening and after a few false starts I managed to get a good enough mix that filled the trench. 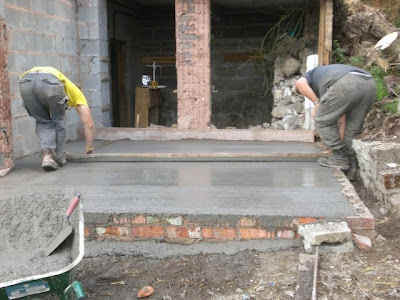 This will form the base for the bricks which when placed will form the edge of the new floor. 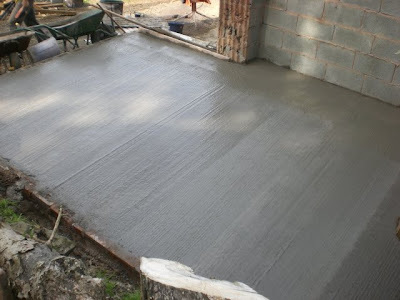 Once they are laid the floor can be mixed and poured in. Easy. Lilly had her operation today and it was very successful, she is recovering in the cottage now and just about managed some pate for dinner. Poor pup. 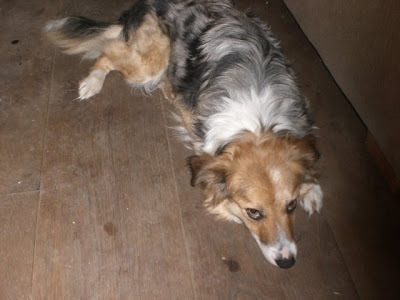 This is Lilly, a lovely Merle Collie who we have fostered for a long while now, a totally adorable little dog. 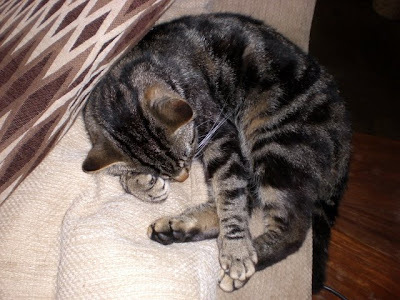 Tomorrow she is going to be spayed, so no food for her tonight, much to her disgust! We are preparing to say goodbye to her this weekend when she will travel across the country to Dover to a new home with another smallholder. It will be very hard to say goodbye to this one but she is going to a wonderful new home and we are sure she is going to be very happy. She just doesn't look it at the moment! The eggs in the incubator have been candled, 13 out of 19 seem to be showing signs of life, 14 more days to go to see how many we get! The smallholding has been run today by Tracey who allowed me to feel sorry for myself and wander around sniffling and moaning about life the universe and everything as man flu wreaks havoc with my mood. I manfully took on the pig feeding as I didn't want her to be eaten. As per usual when Tracey is running things the day went very smoothly, she even spotted this young horse trying to escape. He was tethered by the remains of the bale and had obviously had a nice time, seen here looking very relaxed, but felt the urge to wander off. Somehow he managed to untie himself and just as Tracey was sat having a well earned cuppa she saw the top of his head go past the window as he set off down the lane. 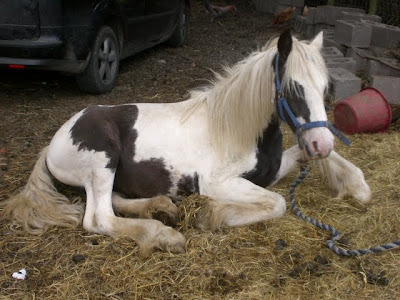 His tether trailing on the floor Tracey crept up behind him and took hold of the naughty horse leading him back to his field. Sprung! Earl is making a swift recovery and making the most of five square meals a day with all the milk he can drink. He has managed to venture outside but found that all a bit overwhelming and rushed back inside. The others have either forgotten who he is or they were the ones who had formed a Cat Council and banished him because when they see him they hiss in his face poor lad. Whilst he is getting better I am worse, temperature, headache, joints ache and I am sick of pigs so I think its definately swine flu. As such not much got done today although I did scrub the oak floor clean. Amazing how bored you get sat indoors! They have reverted to type, the uneasy truce is over and the pigs have resorted to biting me as I feed them. The one in the middle is the definite leader of the clan and she is also the friendliest. 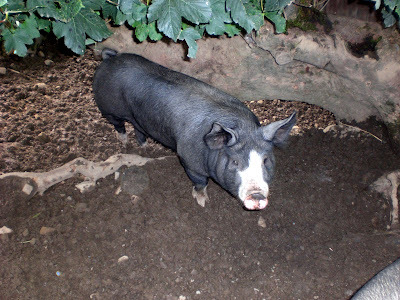 It is definitely the boars that have caused the mayhem in the pen. I watched them tonight whilst trying to staunch the flow of blood from my calf muscle, the two boars were dragging the gilts away from the trough as they ate their dinner by their ears! Enough is enough, I have got my tagger ready and they are going to be sent away to the abattoir as soon as it can be arranged. Thus allowing the ladies time to grow fat for pig club. I must admit to having a complete sense of humour failure tonight when I was bitten. I have man flu so am desperately poorly. Its probably swine flu, everyone who has had the tiniest sniffle at work has taken five days off.